Centered on an educational performance by Jeffrey Bucholtz, this film enhances our cultural understanding about the connections between different forms of oppression, and how those oppressions facilitate sexual violence. With interviews, comedic & dramatic monologues, lecture & spoken word, this film is an essential tool for those seeking to end violence. A study guide to accompany the film can also be purchased. 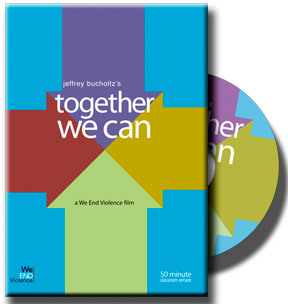 Together We Can is an educational performance by Jeffrey Bucholtz about our cultural understanding of the causes and solutions to sexual violence. With comedic monologues, interactive exercises, and an examination of popular culture, this film is an essential tool for those seeking to engage bystanders and end violence.